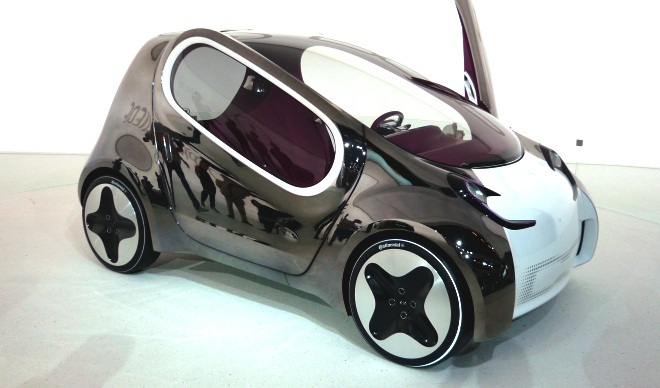 The Paris Motor Show, which opened to the public today, is awash with green cars. Frugal diesels, electric concepts and hybrids abound. While some may argue that Jaguar’s C-X75 turbine-powered hybrid supercar is the star of the show, its over-the-top nature left me cold. I was more interested in more modest concepts with much greater relevance to the crowded streets of reality. Kia’s Pop concept – a three-seat city car with dark chrome sides, raspberry interior and battery power – blends simple geometry with soft organic curves. Obviously not destined for production in its current form (the windows wouldn't wind, for one thing) but outstanding nonetheless. There’s ample room for two up front, nestling on a sort of chaise-longue bench seat, while a third person can sit sideways at the rear, gaining access to their seat via the rear, side-opening hatch. 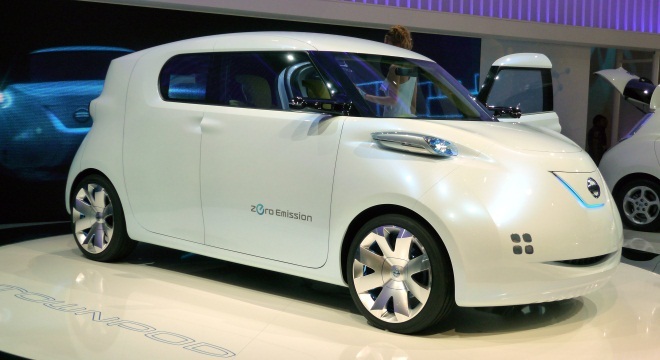 The offbeat Townpod concept combines van and car while nodding to lots of other Nissans. The smiling, cartoonish face recalls Nissan’s wonderful swivelling Pivo 2, which boasted a grin like a Tellytubby. The electric underpinnings come from the Leaf, the DLO (that’s designer-speak for the window area) resembles that of the Juke soft-roader, while the stance and proportions are chunky-slabby like the Cube. A mixed bag then, but it works. 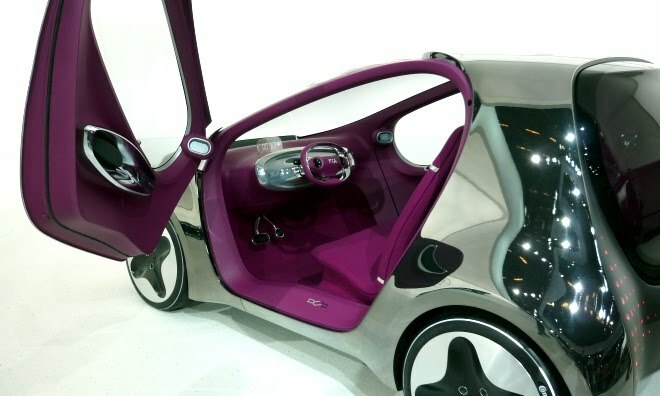 Renault has bravely stuck to its guns in transforming its Twizy electric quadricycle from concept to road-ready reality. The ultra-narrow two-seater will be available in a range of striking colour schemes, for buyers who feel it doesn’t stand out from the crowd quite enough as it is. 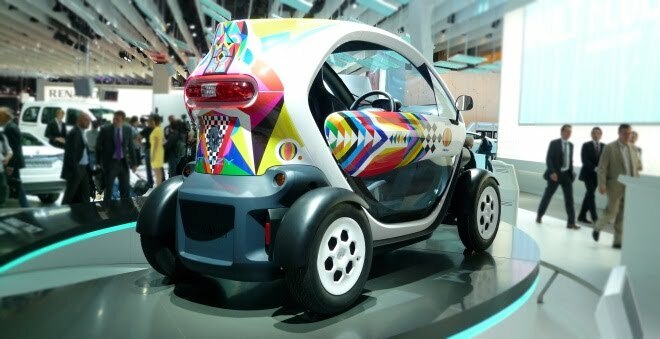 Scissor doors complete the Twizy’s extrovert picture, although they are functional for a vehicle destined to squeeze nose-to-the-kerb into half-spaces on Parisian boulevards. Renault’s Zoe Preview gives a broad hint about the shape of a future Clio-class car from the French manufacturer. And very shapely it is too, with interesting creases and curves in all the right places. There will be battery-powered Zoe ZE in due course, which will be a much bigger deal than the three-box Fluence ZE. The Preview concept gives no hint about where Renault’s big, swappable battery might fit. The only space big enough in the concept would appear to be the boot. The whole of the boot. Will Renault have to repeat the trick it resorted to with the Fluence ZE, and add extra length to the Zoe’s pert derrière? 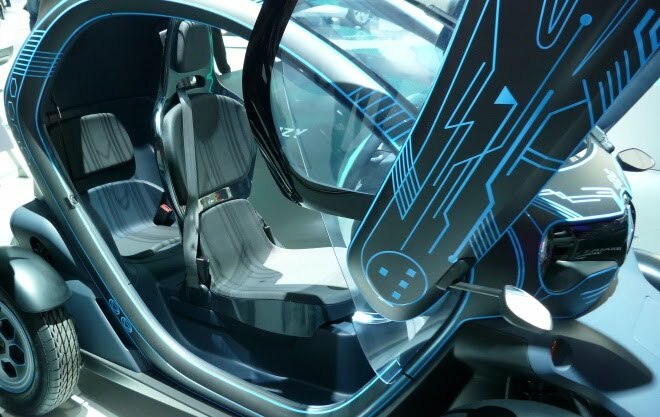 Or will the Zoe ZE abandon battery swapping and put the cells in a thinner, wider layer under the floor and seats, in the style of the Nissan Leaf? For my money, I would guess the latter.